Silicon Knights has come to be known for many things, mostly negative. One of the reasons they became so notorious though, was due to their former success. 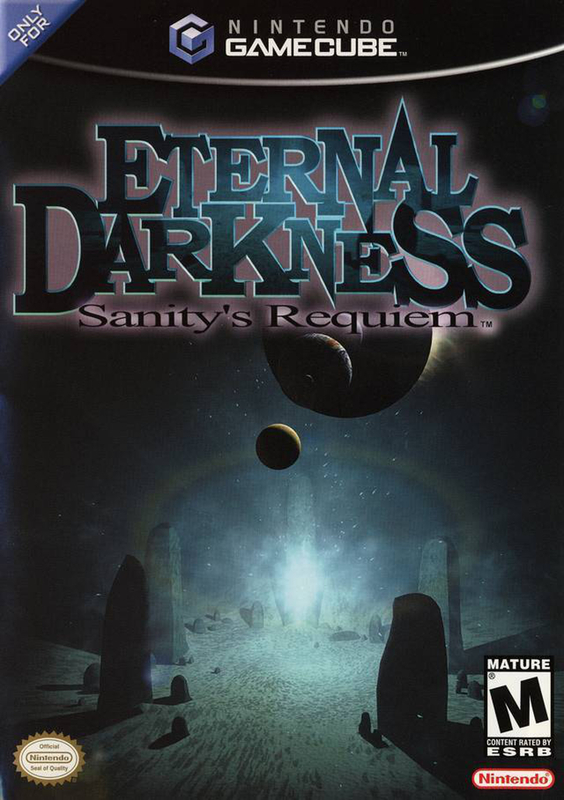 Without question, Eternal Darkness: Sanity’s Requiem was one of the studio’s highest highs. A survival horror game, published by Nintendo for the GameCube, the game met high praises upon its release in 2002, and is still fondly recalled. I recently played through the game, and while enjoyable, I didn’t become a rabid fan. For all of its uniqueness, the game feels pretty dated twelve years after its release. 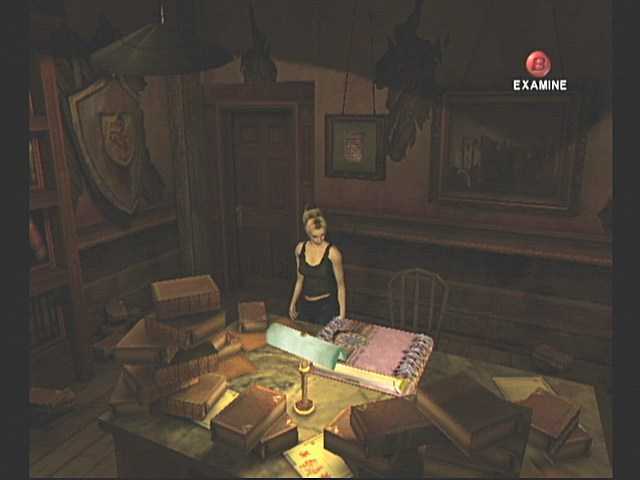 Alex discovering the Tome of Eternal Darkness in her grandfather’s secret study. The game’s primary protagonist is Alex Roivas. Her grandfather was just murdered and she’s now the last of the family. Edward dealt heavily in the occult and as Alex searches for answers to his murder, she becomes embroiled in a struggle between good and evil that dates back at least two-thousand years. Center to her quest is the Tome of Eternal Darkness. As Alex discovers pages to the Tome, scattered about Edward’s mansion, she is taken back in time and relives the struggles of her ancestors as they work to prevent the revival of evil ancients. This facilitates an interesting storytelling mechanic and a wide cast of characters. I don’t care who you are, time travel is always interesting. Personally, I think of it in context of futuristic science-fiction, so its usage in the game was something different. Alex’s reading of the Tome was translated into individual sections of the game, where I controlled characters as diverse as a Roman centurion, a Cambodian slave, and a World War I soldier. Those characters, as well as many more filled out the game. The environments were as varied as the characters themselves. This is an astonishing fact as there were only a handful of settings. The locales were revisited through the ages, and while they were mostly identical, they remained fresh by virtue of the aging process and the period pieces I’d obtain and use in them; unlike say, Devil May Cry 4. As the game dealt with many time periods and characters, the items and weapons I’d come across naturally fit the setting. Generally, each character gained access to multiple weapons, with the majority of them being swords. These highlighted the inventive combat system well. I had the ability to target different portions of an enemy’s body – head, torso, or upper appendages. I almost always went for the head as it was the quickest way to deal with an enemy or cope with a crowd, although striking appendages was helpful in many circumstances too. Besides swords, I came across many guns and long range weapons. In my experience with the game, these were useful against only one enemy and one boss. Don’t get me wrong, I could use them on anything, I just didn’t find them effective. 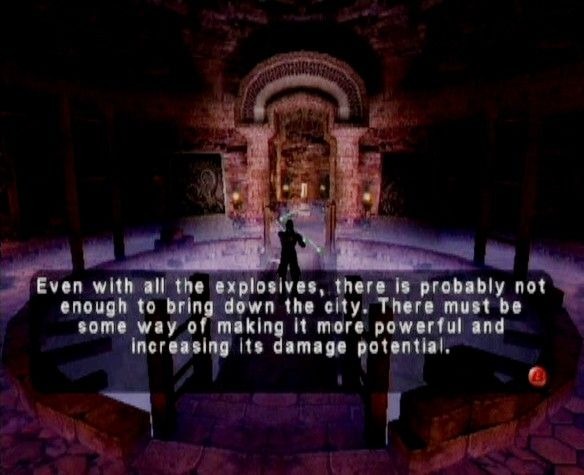 Ammunition wasn’t an issue, unlike other survival horror games of this period. Finishing enemies boosted a character’s sanity. Another aspect that differentiated this game from its peers was its distinct lack of tank controls. No matter the character, I was able to freely move them about. Coupling this with what I perceive as an enhanced focus on combat because of the targeting system and lack of inventory/ammo management, and this game skews more towards the action spectrum of action-adventure. However, like games of this ilk, there are plenty of items to find and puzzles to solve. Or…, association puzzles, as I’ll call them. These are what I found in the Mansion games and Juggernaut. Through exploration, I’d stumble across something I could interact with, generally nonworking; for instance, a telescope missing a handle. Eventually, I’d find the handle, and putting them together, I’d be able to advance the story. These types of “puzzles” were never too difficult, although this game stumped me more than once. Or, it stumped my friend and me, as we played cooperatively. Yes, more than once we flat out got stuck and had to source GameFAQs. In these few instances, the solutions were obvious, but for whatever reason, we didn’t crack the game’s logic. An example: playing an archaeologist in Cambodia circa the 1980s, we roamed the entirety of an ancient ruin not knowing what to do. We had examined a handful of spider webs earlier, which spurred the archaeologist to think they might be obscuring something, but we believed that a nonstarter. We thought this because it was clear there was nothing behind them when they were examined. WRONG. In his inventory, he had a brush that we used earlier to clear away dirt. When used on the spider webs, an important item was discovered, allowing us to progress. There were a few other instances of this, and it was extremely demoralizing. The writing in the game – the story and descriptions – was so good. Very atmospheric and dark. 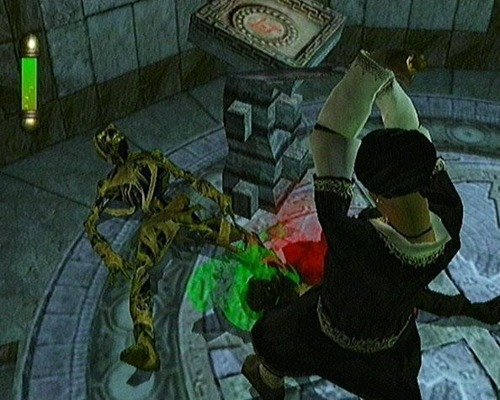 My time with Eternal Darkness: Sanity’s Requiem started strong. An impressive narrative wrapped around an inventive storytelling mechanic and large cast of characters served well to draw me in. The unique combat system and strong playability were nothing to scoff at, especially considering its peers. However, the weak puzzles and sometimes confusing internal logic required to progress grew tepid. AND, there are sanity effects that I didn’t even mention! Honestly, I was a little underwhelmed by them because I always kept my sanity meter high. By the end of it, I was more jazzed than ever to see how the story culminated, but I was ready to finish playing the game. It’s still a very impressive game. But, it was more impressive twelve years ago, just like Silicon Knights.